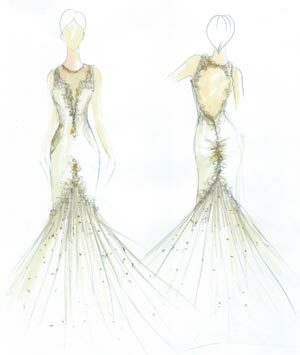 Design your dream dress in collaboration with bridal designer and couture dressmaker Angela Kim. You’ll have a unique, luxurious and fun experience that you will always remember! She listens to you—your inspirations, your images, your style, your story. Angela Kim knows how to bring those elements to life in your custom wedding dress and other luxurious apparel for your most special occasions. You’ll treasure not just the clothing, but especially the experience of working with a professional who is an expert at creating a look that feels just right for you. Customized, perfectly fitted, with exquisite attention to detail—that’s what you deserve. Unique, one-of-a-kind, extraordinary — like you. Like Angela Kim Couture. First, you’ll talk with Angela about your ideas and concepts, make fabric selections and look at initial sketches. Then we invite brides to visit our upscale Asheville atelier. Or, if you’re out-of-town, we’ll make arrangements for a video chat or phone conference. Next, Angela will design an original pattern for your dress, and you’ll meet with her for fitting sessions. If you’re local, time is built-in for regular alterations and fittings, which allow you to monitor the evolving design throughout the tailoring process. After the final fitting session, Angela will make any last minute adjustments, if you’re one of our local brides. Because every dress is made-to-order, most clients need few if any alterations. You can expect the entire process to take from 8 to 12 weeks. Angela’s mission is to provide her brides with a unique and memorable experience, by bringing their dream custom wedding dress to life with a one-of-a-kind design using the highest quality fabrics and details. She works closely with each client to ensure that every detail is perfect, and that the dress is as uniquely beautiful as the bride. Angela has worked internationally as a fashion designer for over 20 years, and she brings that expert and personal touch to every project. We are located in Asheville, North Carolina. We assist clients both locally and around the country. If you are located outside of the Southeast or cannot travel to Asheville, we can do your design consultation via Skype, phone or email. Angela creates one-of-a-kind bespoke dresses at a price determined by a number of factors, like fabric selection and embellishments, number of fittings, and construction time. Like every client’s vision, every project is unique. Please contact us for a quote on your project, and Angela will help guide you to the right solution for your needs. What is the production and turnaround time? The design process takes anywhere from six to twelve months. Project length is determined by the complexity of each dress and the bride’s timeline. The length of construction is dependent upon the fabrics we’ve selected; sewing delicate lace, draping flowing silks, sculpting luxurious chiffon, and applying intricate beading all take time. Time is built-in for regular alterations and fittings, which allow you to monitor the evolving design throughout the tailoring process. Do you design other types of dresses? Yes! In addition to couture wedding dresses, Angela also designs evening gowns, cocktail dresses, mother of the bride dresses and other bespoke clothing. Do you do fitting sessions? Absolutely! 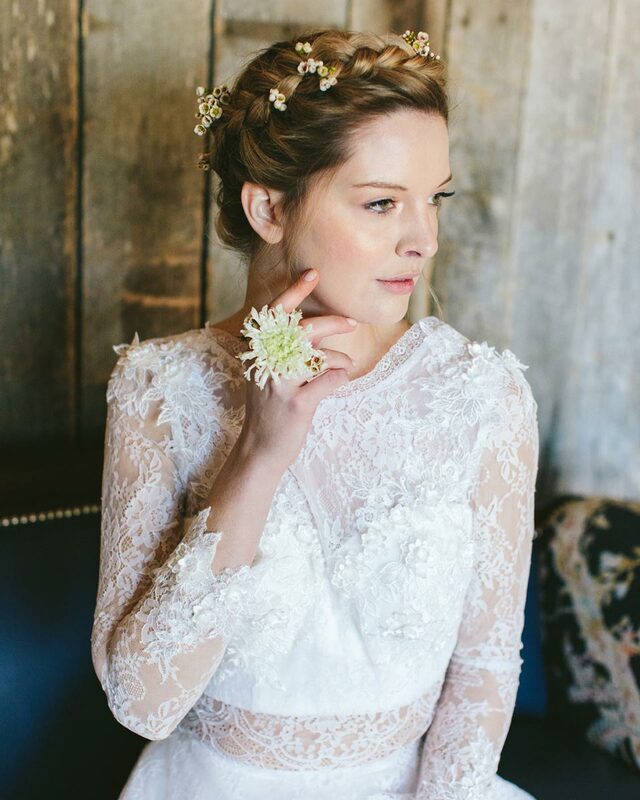 There is no extra charge for our local or visiting brides who have fitting sessions at our Asheville atelier. Your fitting sessions are an important and fun part of the process as your dream dress comes to life. Our out-of-town brides will need to have measurements (according to specifications we will provide) taken by your local seamstress. All of our dresses are designed according to your custom measurements. If you are not having your measurements taken by us, we will provide you with all the information you will need to have your local seamstress take your measurements. If the measurements are taken properly and the client does not experience major weight changes, the dress will need few if any alterations, as it has already been made-to-meausure. Any further alterations would be up to the client. The best way to prepare for our initial consultation is to gather ideas about your personal bridal style. Ask yourself questions like: What trends am I drawn to? What fabrics do I love? What silhouettes make me feel beautiful? Next, set aside time to research. Page through bridal magazines, browse Pinterest for ideas, perhaps even try on a few dresses at a boutique. Make sure to take pictures and save examples of what you like and dislike and bring them to our meeting! Angela will work with you to develop an inspiration and include key elements that are important to your bridal vision. It can start with the love of a certain fabric, beading, design element or even a silhouette. Each design process is tailored for you so there is no wrong way to start as we work together to bring your gown to reality! Bring your dream custom wedding dress to life with award winning fashion designer Angela Kim.